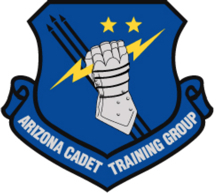 The 15th Cadet Training Group of the Arizona Wing is pleased to announce 2019 Arizona Wing Summer Encampment will be held on Saturday 22 June to Saturday 29 June at the Fort Huachuca Army Base in Sierra Vista, AZ. Cadet Cadre will arrive on 19 June for training and setup (see your email for arrival instructions). The arrival time for cadet students on 22 June at 1200 noon. Students are to arrive in BDUs/ABUs, there will be no opportunity to change into BDUs/ABUs upon arrival. Students should also have eaten lunch prior to arrival. Graduation is open to all family and friends, it will be held on Saturday 29 June at 1100 hours at the Barnes Field-house football stadium. There are bleachers but limited shade. Graduation should last approximately an hour. 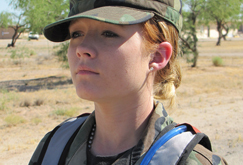 Yes, encampment is required before a cadet can promote to 2d Lt (Mitchell Award), and encampment is required before a cadet can apply to attend a National Cadet Special Activity. It is, however, much more than that. 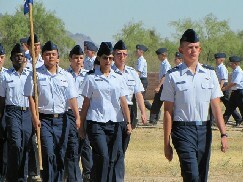 Encampment provides the cadets with training in a variety of areas, some which are academic and some which are physical. The cadets learn much more than just the academic and physical parts of CAP life. They learn to work as a team and through these activities, develop a sense of camaraderie and belonging, as well as trust. The cadets develop bonds that cannot be as easily established elsewhere. Cadets learn discipline which is designed to strengthen each individual as well as each team. Discipline is required for an organization to function properly and safely. They learn self discipline (getting done what needs to be done on time), group discipline (teamwork), and imposed discipline (following orders and regulations). So far if this sounds like a lot of work, well, it is! It is NOT an "in your face, screaming at you" boot camp. It is also not a typical summer camp. While they do learn military discipline and drill, the cadets are not yelled at, singled out, or "hazed". Exercise is never used as a form of negative discipline. Any correction that needs to be made is expected to be done out of earshot of the rest of the cadets. Praise is expected to be in front of all. Cadets are expected to come physically and mentally prepared for encampment. They are expected to follow rules and regulations, and they are expected to fully participate in all activities. If a cadet is unable to participate in an activity for some reason, it needs to be reported immediately to the flight sergeant, flight commander, or Training officer. Cadets are expected to finish encampment. CAPP 52-24 outlines the requirements for encampment. Cadets MUST complete 80% of the required curriculum to graduate. The first couple of days are the hardest, especially for those who have not been away from home, but the cadets adjust and become a member of the flight. They frequently find an area in which they can "shine" and learn to develop leadership skills. Encampment is an experience cadets do not want to miss! Cadets and parents (regardless of the cadet's age) will both sign the cadet encampment contract. You are stating you have read the contract and you understand the purpose and expectations of encampment cadets. The encampment staff is not involved with transportation to or from encampment. Individual squadrons are of course welcome and encouraged to arrange for carpooling opportunities within their squadrons.